This is one of my kids favourite stories of all time… they love the Swishy Swashing! Splash Sploshing! Squelch Squerching! Stumble tripping! Hooo Wooooing! the Tiptoeing! that happens in the story. I love their excited faces as we reach the part of the story when we actually go into the cave and find the bear and have to do the whole adventure in reverse. Do you live your life in the hurried reverse of trying to get home before the bear gets you! In real life the bear may not be the bear itself, it might be ‘getting the kids to school on time’, ‘getting homework done’, ‘it might be getting dinner done’, might be simply getting your job done so you can go to the promotion. 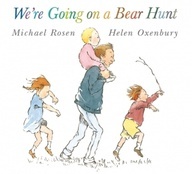 The bear is a metaphor for life, and every time I read this story to the kids I enjoy it, but I also feel the pressure of whatever bear is next in line to be done.